It all started when my cousin Yvette felt I was too slim to go into modeling. Janart Fareed Addo a student of Miami University, OH who won 1st Runner Up of the just ended Miss Ghana USA during an exclusive interview with Hostess of KubiLiveChat, Baby Da Model revealed to us how she was able to gain a crown. She was asked by Baby; You made mention of you being Miss Ghana USA 1st Runner Up, 2017. How did it all start my dear? She replied; It all started when my cousin Yvette felt I was too slim to go into modeling. We looked up events that were rolling and cultural. 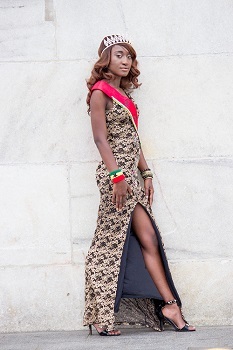 There was a long list but I decided Miss Ghana was the best because I love My country. Nothing spells patriotism as representing your country in a foreign land. So I joined the race with all luck and support from family and friends. Here we are with a crown. She further went on to disclose, But it will surprise you to know I was denied entrance to Miss Malaika Ghana when I applied.